THE TRUMP CARD GETS HIMSELF MEDIA ATTENTION, AGAIN. The Donald has once again grabbed the media spot light and has announced that he has a a major announcement in Las Vegas today. It is being reported byKLAS-TV8 that Donald Trump is going to endorse Newt Gingrich. The announcement is slated to “pertain to the presidential race, according to a statement from Trump’s office. Gingrich claims he has no idea what Trump is going to say. Man he has a way of continually bring attention to himself doesn’t he. Just curious, when did Donald trump become politically relevant? An advisor to Donald Trump says he will make a major announcement in Las Vegas tomorrow. Sources tell the 8 News NOW I-Team Trump will endorse Newt Gingrich. One might ask themselves why would Donald Trump get involved at this point in the GOP Presidential primary and endorse Newt, especially after Gingrich was just hammered in the Florida primary? Doug Powers at Michelle Malkin.com has come up with some plausible reasons why The Donald wants the media attention. Maybe there will be a subliminal message flashing in the back ground that says, “YOU MUST WATCH THE CELEBRITY APPRENTICE”. What are the chances that Trump will make a reference during his announcement that the new Apprentice show begins in two weeks? It is free advertizing after all. My take is if Trump does endorse Newt Gingrich, who because of not being on so many primary ballots has more than an up hill climb for the required delegates, The Donald is doing it to set up a potential third party run. Its a win-win for Trump. This was he can say either at the end of the GOP primary, my candidate won, look at me, I am so relevant, I am a king makers. Or if Romney wins, he can then say, I am running as a third party as I do not think that Mitt is right for America and still put himself out there is the MSM limelight. Of course, any third party run by Trump is a victory for Obama. UPDATE I: Looks like all the so-called pundit politicos in the know got it wrong … TRUMP endorses Mitt Romney. That is correct, The Donald picks Romney. As the Daily Caller opines, there are some with quite a bit of egg on their face. In the end, The Donald went with what he is perceiving as the sure thing. According to ABC News, Donald Trumps minions are exploring a potential third party run for The Donald for the Presidency in 2012. Trump did not want to go through the process of a primary and have his past, finances, tax returns, multiple bankruptcies, marriages and past positions and comments fodder to be dissected by other candidates or the media in debates, but he wants the pass and run as a third party. Nice. Donald Trump’s top political adviser told ABC News he’s speaking to “high-level political operatives” to explore a third-party presidential bid on behalf of the real estate mogul, in a sign that Trump may not quite be done with the 2012 presidential race just yet. “I can confirm that over the past two weeks I have spoken with many high-level political operatives, campaign managers, finance directors — some of whom I have spoken to in the past. Most are new people from all over the country,” said Michael Cohen, executive vice president at the Trump Organization and special counsel to the reality-TV star. The Donald continues to shamelessly self-promote himself and his TV show at the expense of a Presidential primary. How pathetically sad. This egotists knows damn well that if he ran as a third party candidate that it would mean sure victory and reelection for Barack Obama. 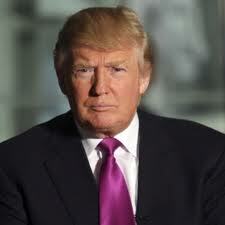 If Donald Trump actually does run in 2012, we will then know what his true politics really are. Honestly, I think its more to keep his name in the news and free PR for his TV show, The Apprentice.